Professional services firms face significant challenges in structuring compensation and benefits programs that appropriately reward superior performance. 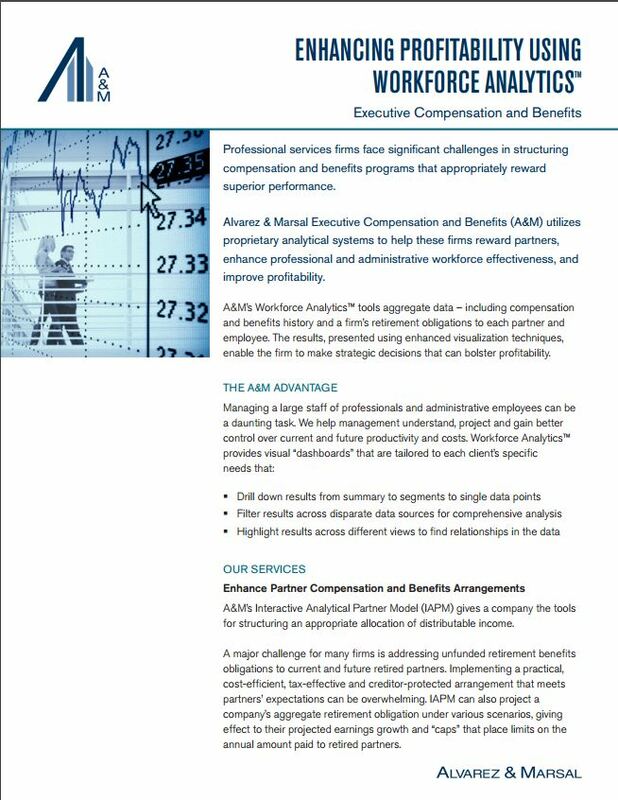 Alvarez & Marsal Executive Compensation and Benefits (A&M) utilizes proprietary analytical systems to help these firms reward partners, enhance professional and administrative workforce effectiveness, and improve profitability. A&M’s Workforce Analytics™ tools aggregate data – including compensation and benefits history and a firm’s retirement obligations to each partner and employee. The results, presented using enhanced isualization techniques, enable the firm to make strategic decisions that can bolster profitability.